Every winter, thousands of anglers take to New York’s frozen waters in quest of their ice fishing bounty. Ice fishing can be a relatively easy and inexpensive way for the entire family to enjoy some mid-winter outdoor fun. Terrific ice fishing opportunities can be found within or in close proximity to many state parks; with several free fishing clinics and derbies occurring each year that introduce new ice fishing anglers to the sport. Chances are one of these hard water fishing opportunities is close to you! 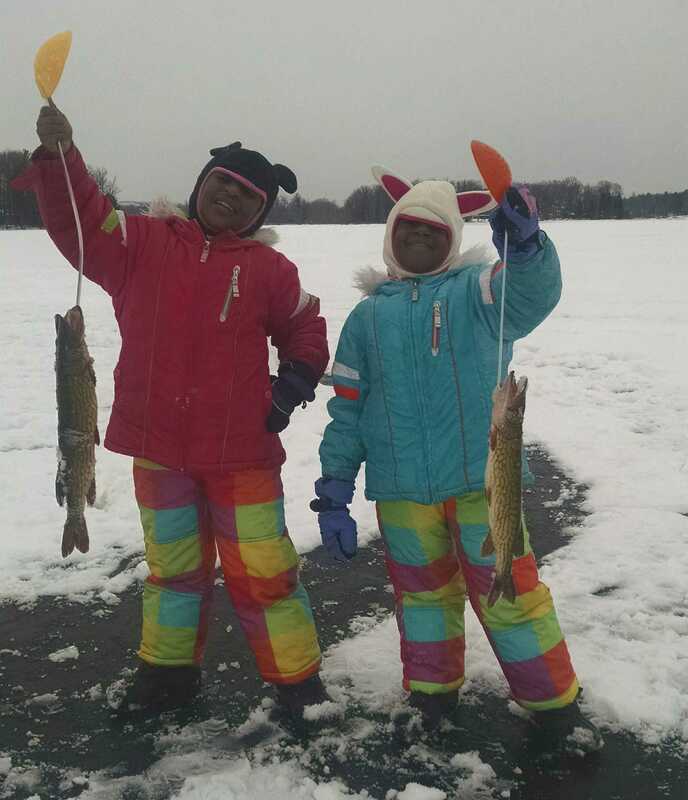 Tom’s (the author’s) 6-year-old daughters Anna and Izzy Hughes caught their first fish through the ice from Tully Lake on January 18, 2015. They worked together to land two pickerel, which they later had for dinner that night. Former OPRHP Park & Recreation Aide Stephanie Smith landed this chain pickerel near Glimmerglass State Park in 2013 fishing with a tipup baited with a golden shiner. Ice fishing does not require a lot of expensive gear to get started, especially compared to other winter sports like skiing, snowboarding and snowmobiling. Unlike open water fishing, you don’t need a boat to get out on the water…just a nice pair of insulated winter boots. Once out there, you can use all sorts of tools to get through the ice to access your fish, including axes, ice spuds, augers and power augurs. Fishing techniques include actively fishing with small jigging rods or setting tipups (fish traps) rigged with live bait (e.g., shiners or suckers). Many types of fish are active and feeding under the ice throughout the winter months, including bass, pike, walleye, trout and panfish. OPRHP Natural Resource Steward Biologist Tom Hughes (author) shows off a northern pike caught from Owasco Lake. Believe it or not – every season, pike twice as large as this fish are hauled through the ice from Delta Lake near Delta Lake State Park, near Rome! When you feel you are ready and dressed appropriately for New York’s winter weather, come out and join our OPRHP and NYS DEC staff and volunteers at an ice fishing clinic or derby near you! Coming up in February, there are two ice fishing clinics scheduled for Central New York – February 22, 2017 at Otsego Lake, Glimmerglass State Park and February 26, 2017 at Lakeland Park (Cazenovia Lake), Cazenovia. Both clinics are free fishing day events, with no fishing license required for participants. For more information on the 8th annual ice fishing clinic at Glimmerglass, call 607-547-8662 or visit the State Parks calendar. For more information about the ice fishing clinic at Lakeland Park, contact Judy Gianforte, Cazenovia Preservation Foundation, 315-877-1742. Click below to watch a video of Anna & Izzy Hughes catching their pickerel. (Note: You must be using Internet Explorer in order for the video to stream properly). 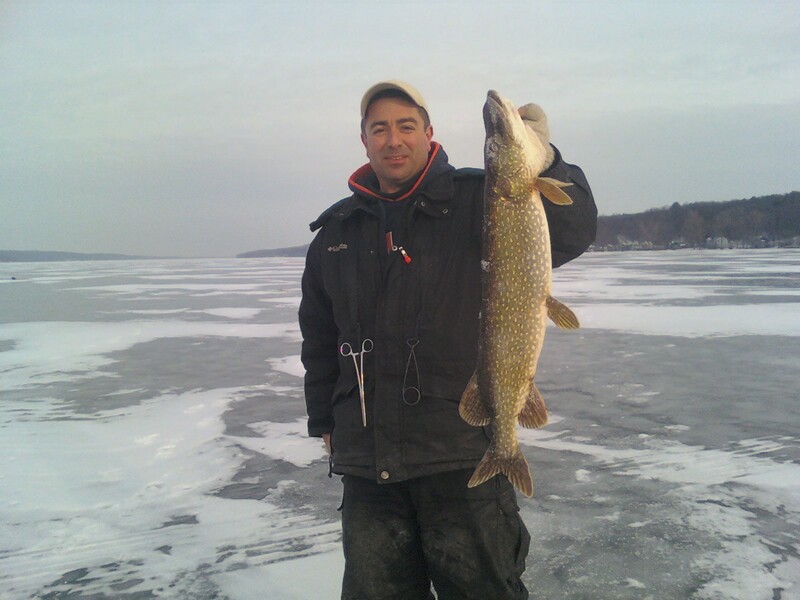 Click below to see another angler Derek Conant from Otisco catching his first fish through ice on Otisco Lake. Post by Tom Hughes, photos by Tom Hughes and Matt Fendya, videos by Tom Hughes.